Speaker of the House John Boehner after a weekly House Republican caucus meeting last year. John Boehner’s first day as speaker of the U.S. House of Representatives came on Jan. 5, 2011 (and it was rocky from the start). This morning, we learned that his last day as speaker and in Congress will be Oct. 30. By that date he’ll have served as speaker for 1,756 days. That’s longer than the 1,457 days served by his predecessor, Nancy Pelosi, and would make him the 12th-longest-serving speaker in U.S. history. 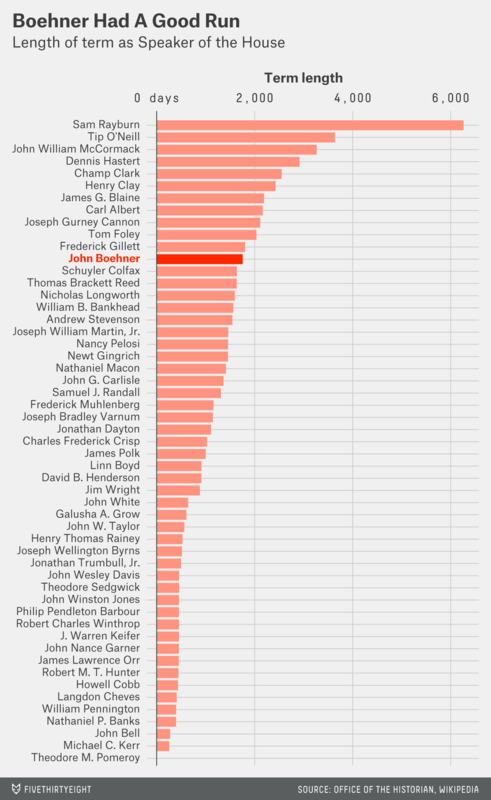 The chart below shows every U.S. speaker and how long they served, according to data from the House Office of the Historian and Wikipedia. Note that we’ve combined all of a speaker’s terms into one, even if they weren’t consecutive.